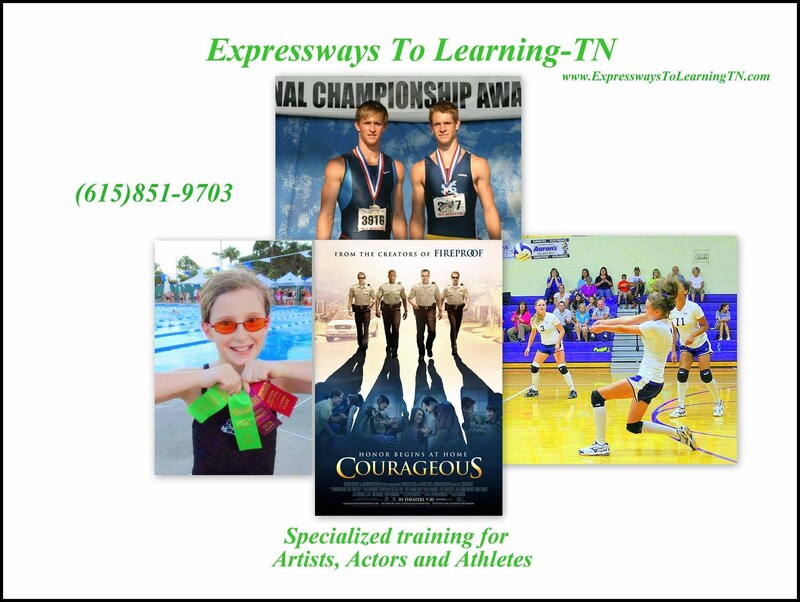 Expressways To Learning® is an education company addressing the needs of children and adults who are creative, athletic, intuitive, sensitive, bright and many times...gifted. Learning Differently sometimes can have tendencies of ADD, ADHD, Dyslexia, or Autism. ETL is an Alternative to Traditional Tutoring and a " Fitness Center for the Brain." This comprehensive system provides computer software for Home Study Enrichment opportunities monitored in real time by ETL coaches along with ACT/SAT Prep, Adult Literacy and ESL for English Language Learners. Brain Fitness Memory Games for Adults are also NOW AVAILABLE and Recommended to increase memory and attention. 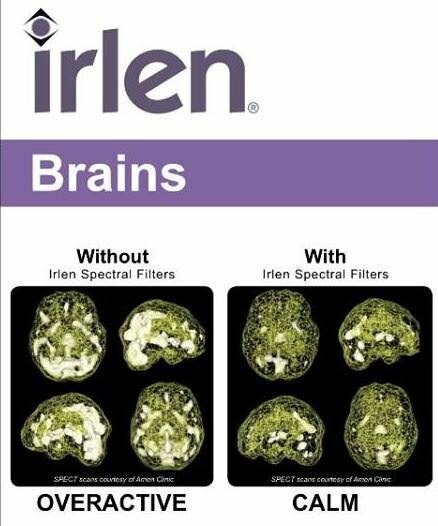 In addition, ETL provides diagnostic testing for Irlen Spectral Filters using colored overlays and lenses for light sensitivity based upon research now offered in 46 countries. 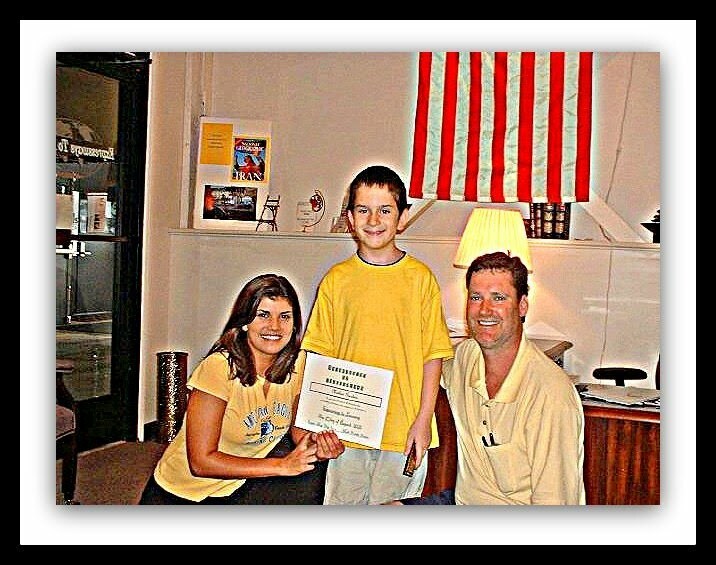 "An Alternative to Traditional Tutoring"
and click on our new link to celebrate serving the Nashville Community since 1988! in a traditional classroom setting? Expressways To Learning® celebrates unique learning styles everyday. In our learning centers, your child will decode information to reformat his or her learning language. Through intensive brain training, we can help unlock your child’s true potential. Our proven techniques make learning fun while simultaneously boosting your child’s confidence and self image. Tailored to your child's specific needs Individualized programs are customized to help maximize your child’s growth with one grade level improvement is expected every eight to ten weeks. 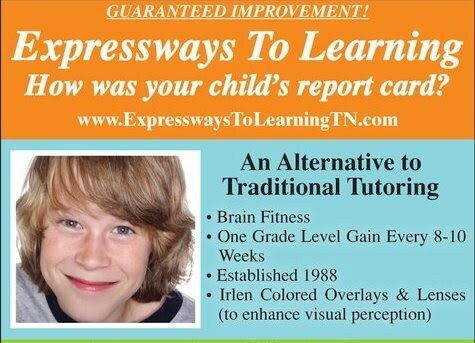 Whether your child struggles, with math computation, reading comprehension, memory recall, ADD, ADHD, spelling, Dyslexia, or Autism, Expressways To Learning® can help! please feel free to call or email us directly at ETLTN@aol.com. Expressways To Learning® is a multi-sensory, multimedia marvel that is revolutionizing the learning process. Expressways To Learning® programs are integrated into masterful systems which profoundly effect the storage and retrieval of knowledge in the brain. They include most of what educators know about learning. Many of the tested and proven principles of the past are combined with today’s technology in a totally unique way. We will review test results the same day and make recommendations of how many sessions will be necessary for your child to reach necessary goals. Schedule classes or begin a Home Study Program where we will license your computer and provide Home Study Check In appointments every 2 to 4 weeks. Weekly sessions are also available along with Home Study programs. Within 2 weeks you will begin to see long term memory results. Each child takes "Ten's Tests" which review all skills taught in a 2 week time frame and you will receive regular progress reports. Utilize this summer to prepare for a succussful 2018-2019 school year for everyone... you, your child, and your family! NEW E-Learning NOW Availalbe for Individuals, Agencies and Charter Schools. Remember to include your email and contact information. Thank you. Brought to you by Lucy! Ask about our Adult Brain Fitness Programs! 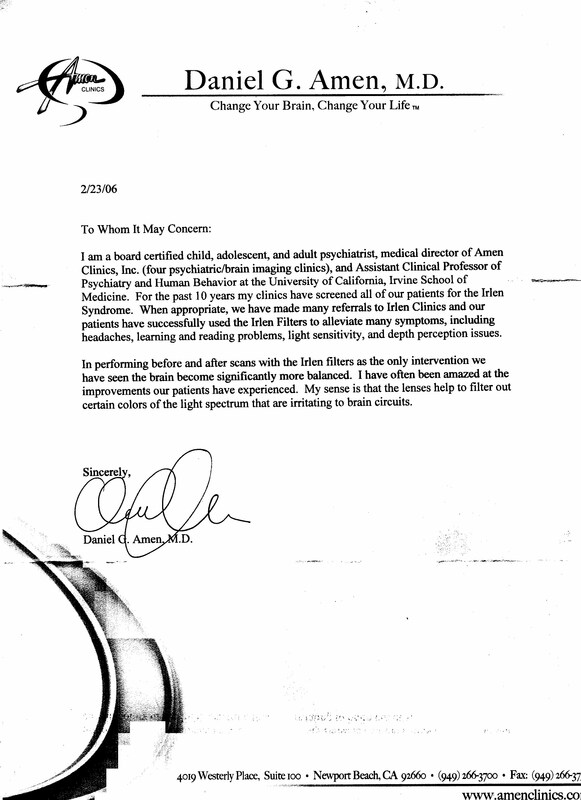 We appreciate referrals from The Amen Clinics! To see if you are a candidate for Irlen Lenses, visit the website and take the Self Test. If you answer "Yes" to 3 or more of the questions, call us to schedule your appointment! 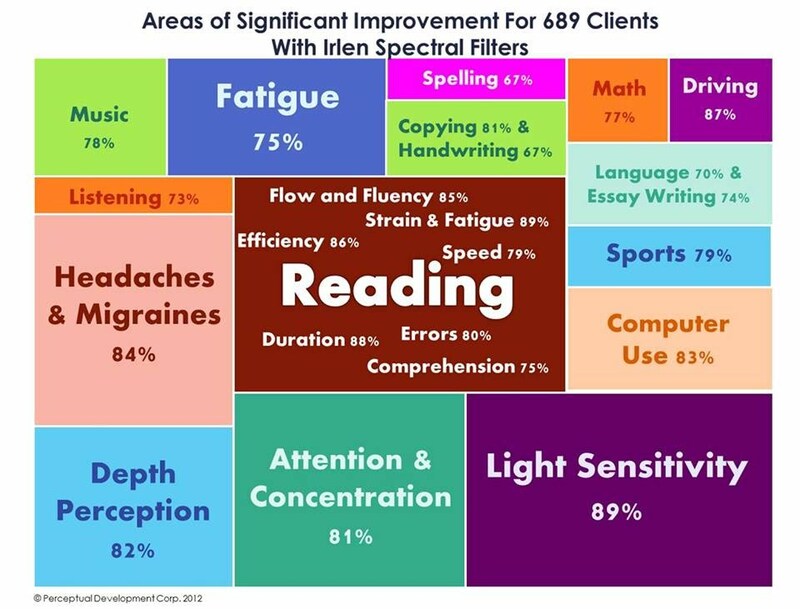 "Areas of Significant Improvement with Irlen Spectral Filters"
Percent of Clients Reporting "Moderate" to "Considerable" Improvement Among Those Experiencing Difficulty. Compliments of Irlen Visual Learning Center & Abilities OT Services, Inc.